The ballet, derived from a tale by E.T.A. Hoffman and created originally for the Maryinski Theater in St. Petersburg in 1892, begins at a Christmas party in the home of Herr Silberhaus, whose son and daughter, Fritz and Clara, are squabbling as usual. Herr Silberhaus’ long-absent friend, the mysterious Dr. Drosselmeyer, brings many wondrous gifts to the party: life-sized dancing dolls for the children, carolers from the village, and a miniature Nutcracker for Clara, which her careless brother soon breaks while teasing her. Drosselmeyer repairs the damage, however, and the party ends peacefully. After the guests have left, Clara returns for her Nutcracker, only to find huge mice scampering about the room and making war on the toy soldiers, who are led into battle by the Nutcracker, now grown to full size. The Christmas tree rises to tower over the conflict as the Star descends from its top to protect the helpless porcelain dolls from the ravenous mice. 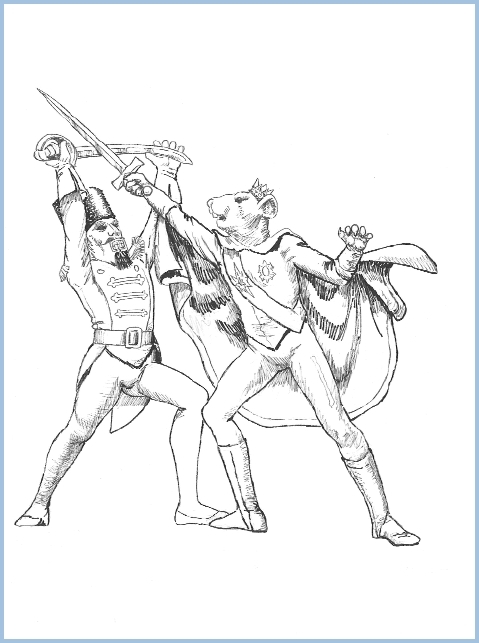 The Nutcracker is nearly killed by the Rat King, but through the brave intervention of Clara, he defeats his enemy and is transformed by Drosselmeyer into a handsome prince. In gratitude for her having saved him from the Rat King, the Nutcracker takes Clara on a magical voyage through the Forest of Snow, where they are greeted by the King and Queen of Snow and their crystal snowflakes. Their journey then continues to the Land of the Sugar Plum Fairy who, having heard the story of their adventures, instructs her Court of Sweets to dance for them. She presents to them: Spanish Chocolate, Arabian Coffee, and Chinese Tea; Marzipan Shepherdesses, Trepak Dancers, and Candy Canes; Candy Flowers, and the Dew Drop Fairy. Finally the Sugar Plum Fairy herself dances with her Cavalier, and Clara’s remarkable evening draws to a close. Copy and color this drawing!